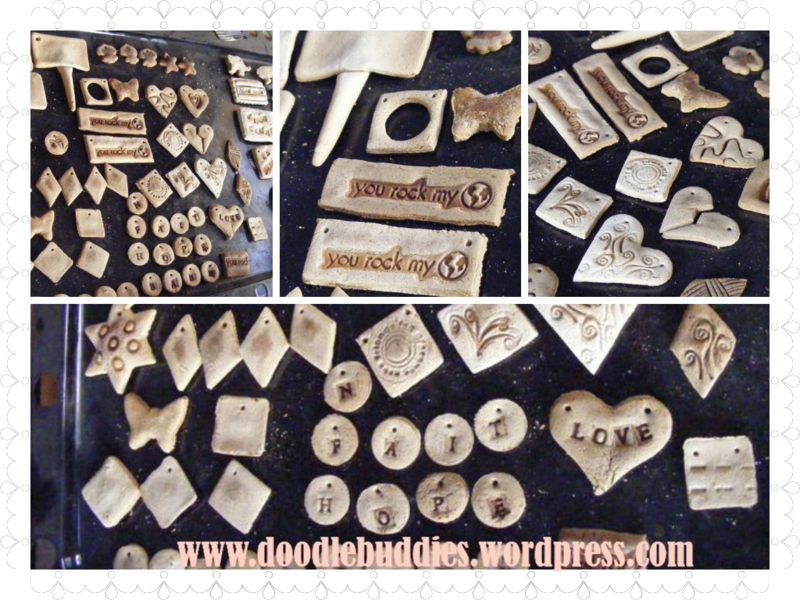 One of my all-time favorite craft medium would have to be the humble salt-dough. 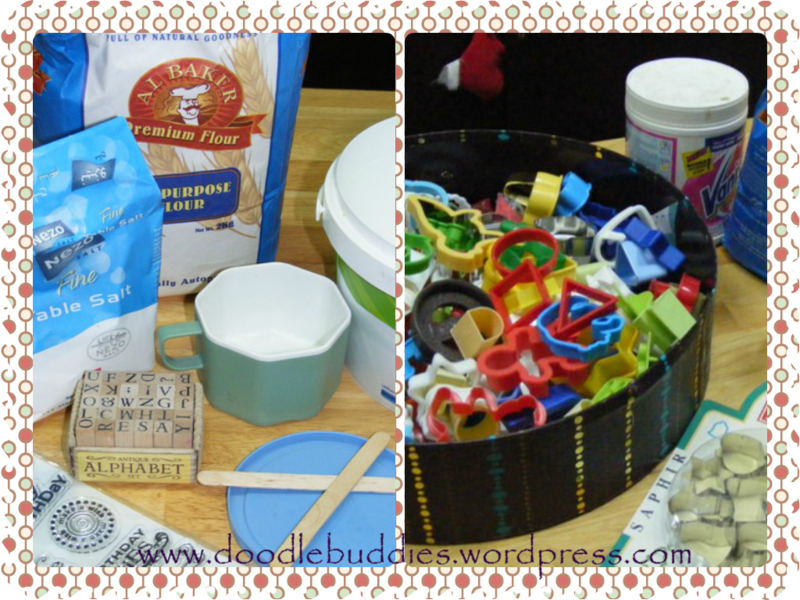 Its one of those easy to make mediums where you almost always have the ingredients at home and the kids can not have enough fun with the endless possibilities. Ofcourse there are several variations to this recipe on the internet but I stick to my tried and tested recipe which has worked for me for over a decade. Here it is. In a large bowl, blend the salt with flour and gradually keep adding the water until a thick palable ball of dough is formed. Knead the dough firmly for a couple of minutes until it can stand on its own and no salt is left in the container.Wrap the dough tIghtly in plastic or put it in a plastic bag secured with a twist tie. Let it sit for a few minutes. You are now, ready to play with your dough. This is the best part of the entire process for little ones. 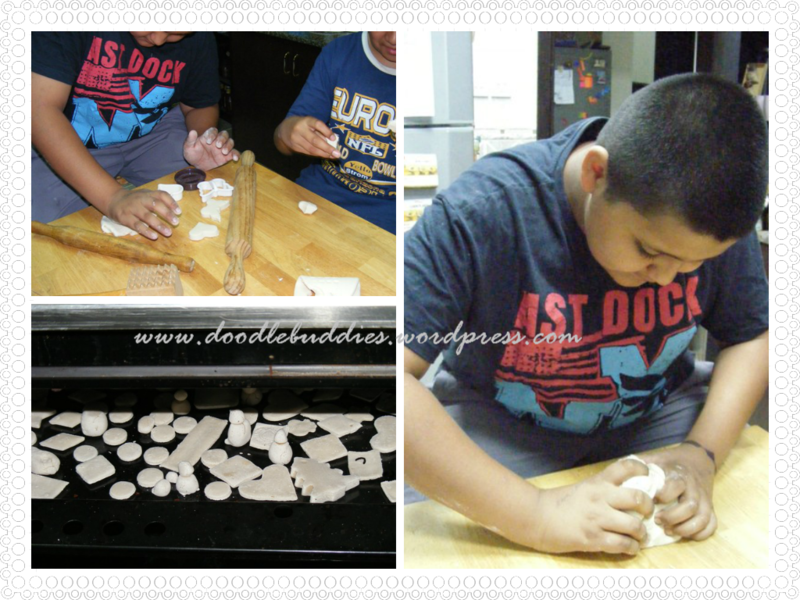 You could let the little ones play freeform or hand them a bucket of cookie cutter and let them have a blast. After items are formed, set them on a baking sheet. Bake in 250 degree oven until items are completely hard. This can be from half an hour for small items to several hours for large ones. Ofcourse, there are variations again. * You can add a bit of vanilla essense or cinnamon powder at this stage. It will leave a beautiful fragrance long after baking. 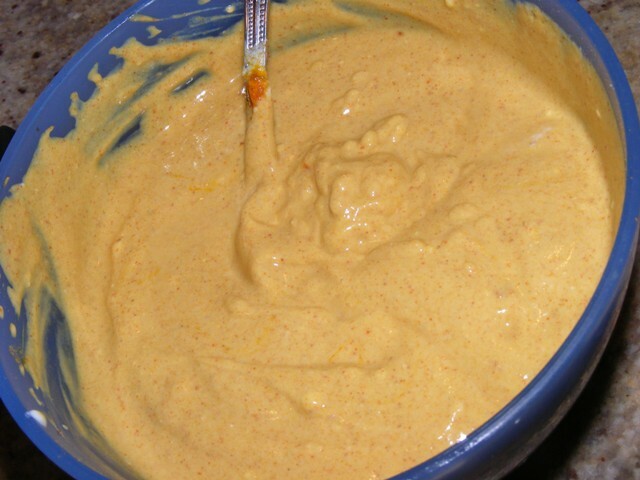 * You could also roll the dough in a cylinder shape and cut 2 inch batches and add a drop or two of cooking color. 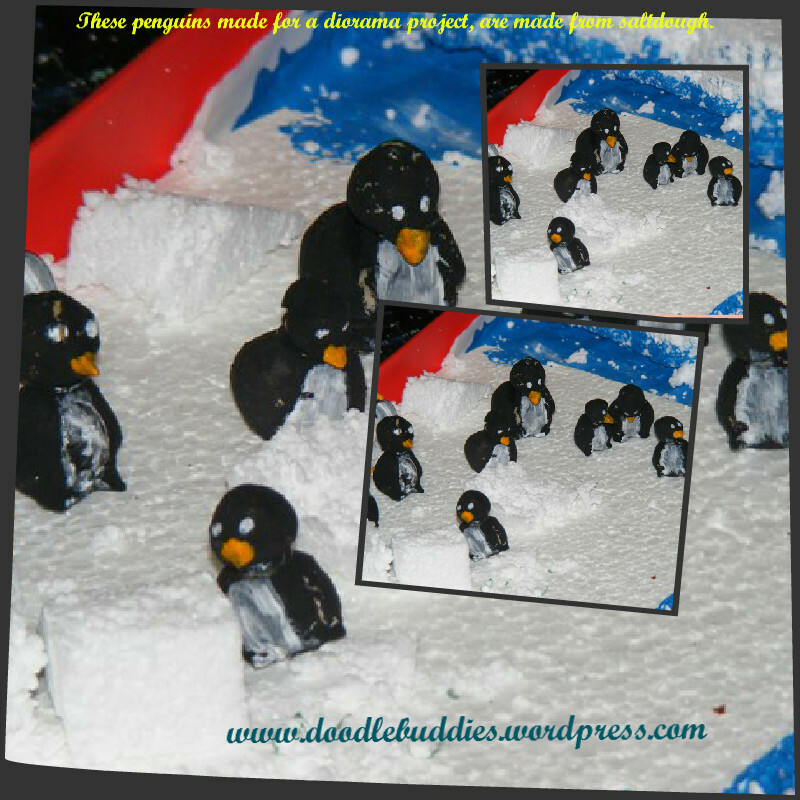 That way, you dont have to color them once you have decided to mould it into your desired shape. Once out of the oven, let it rest for a while on the wire. And then begins the second best part of this activity : Painting 🙂 The kids absolutely love painting their prized creations. Keep all pieces of dough not-in-use wrapped tightly in plastic. Store leftover dough in the refrigerator and use it within one week. Bring the refrigerated dough to room temperature before working with it. Enjoy the salt dough and enjoy making memories. Thank you for visiting me today. Have a beautiful and thankful day. I would love if you could share your salt dough experience with me too !! Alot of people these days have turned to herbal remedies. In my opinion, with the amount of pollution in our air, food and environment, it is really difficult to remain unaffected by toxins ~ they are going to find a way to enter your body ! 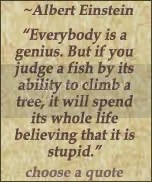 Although I am a firm believer of “preventive measures” ~ there are rarely any preventive meausures, I practise, myself 🙂 Yes, pretty guilty, I’m afraid !! 1 Cup Milk /Day=No Bone Problems. As I have a young adoloscent in the house knocking on his teenage”hood”, I encourage him to have plenty of water. He does ~ I dont !! I have been “gifted” oesteoporosis in my mothers side, and still, cant get myself to drink, soya milk or even normal low fat milk, knowing very well, that I already have bone issues !! And how many coffee’s do I consume in a day ?? and oh yeah ~How much sugar in each cup ?? I dont even want to go there !! Health and me are really miles away from each other ~ actually continents away ! Just realized ~ this post has been more about naush-bashing rather than healthy tips. Leaving you on that note. Nature provides the best cures .. .. but we have all got so used too, immediate actions. 1 ) Anti Cancer : As citral is present in lemongrass, and also in lemon peel, it has the advantage of Killing off Cancerous Cells. A study in 2006 found that no normal cells were harmed, but the malignant… cancerous cells committed cell suicide. This is a seriously amazing find and even more so that lemongrass tea health benefits are found by only using one gram of lemongrass in hot water to get the desired effect . Fresh herb is also containing small amounts of Anti-Oxidant vitamins such as vitamin-C and vitamin-A. 3 ) Detox : İt will helps to cleanse the body by Eliminating Toxic Substances , Cleanses other organs of our body including kidney, pancreas, liver, bladder etc. 9 ) Helps to improve the Digestive System . Folates are important in cell division and DNA synthesis. When given during peri-conception period can help prevent neural tube defects in the baby. 14 ) Its herb parts are also rich in many invaluable essential vitamins such as pantothenic acid (vitamin B5), pyridoxine (vitamin B-6) and thiamin (vitamin B-1). These vitamins are essential in the sense that body requires them from external sources to replenish. Unbelievably beautiful presentation. Wanted to share it with you’ll. 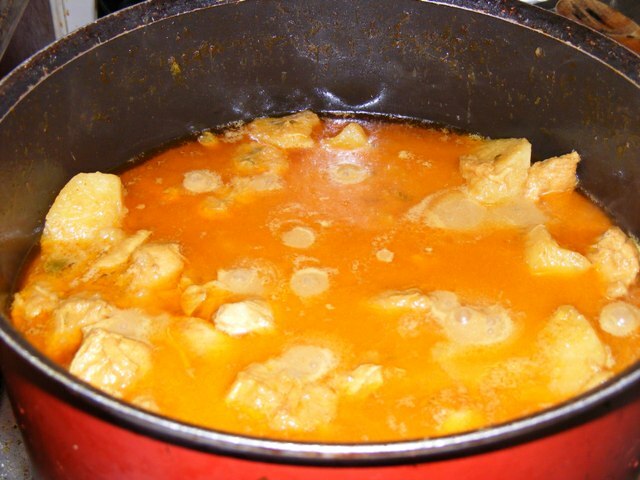 Photo tutorial of an Indian chicken curry. I know this one is a definite first for me. 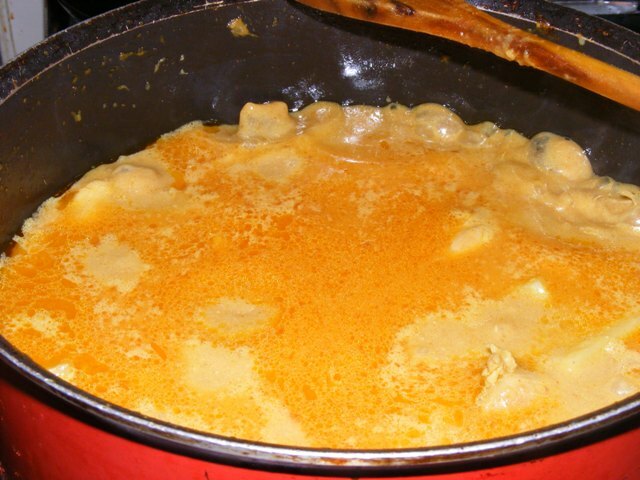 A very intimate school friend of mine, Jaya, whom I reconnected with on Facebook, asked me for a ‘KORMA” receipe. 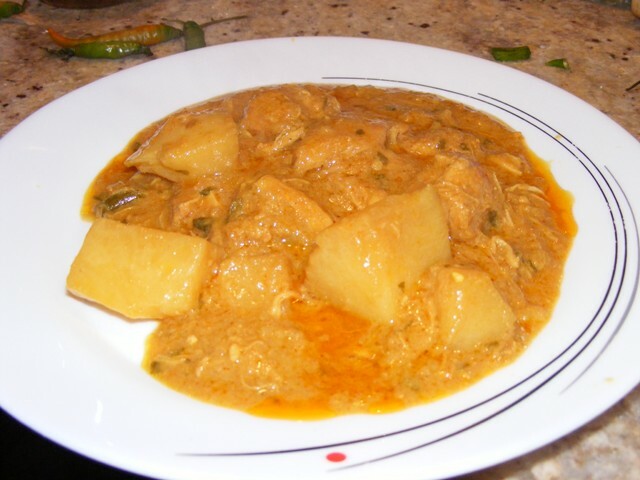 (for those of you who are wondering what Korma is, well it is an Indian curry dish with some form of meat or chicken. 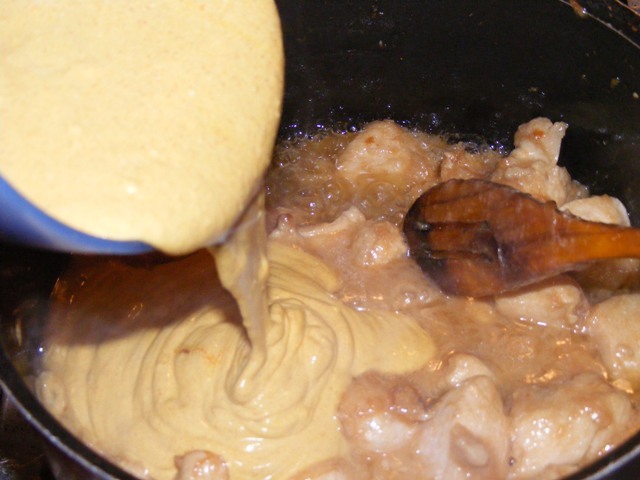 Generally made in a base of yoghurt or cream with some paste of cashew nuts and a few almonds.) That request has been resting at the back of my mind for a little over one month now. Why ? Coz I havent yet figured out how to run my scanner so the recipe book is still just sitting on the epson machine instead of, inside it !!! But then thats just Me ! Ok so on with it. The dish I am showing here is one which I make atleast once a week. It is really quite simple. No fuss et all. However not until the last moment, I had no wild thoughts about doing this tutorial so as I rushed to get the chicken dish done with and not until I had already placed the chicken for browning, did I realize, that I could make a pictorial tutorial of this cooking, just like we do in card making tutorials !!! Eureka !! Where’s that camera ? Ok, since I have missed taking initial pictures, I’ll just explain alittle. 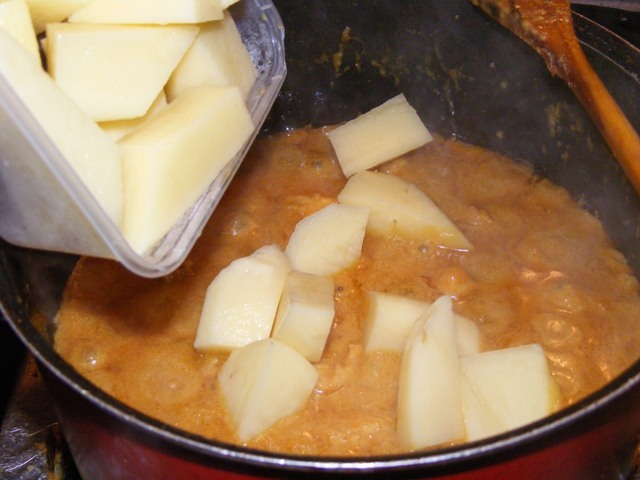 This is a regular indian gravy/curry dish. Not a fancy one, where we have to slog around the stove for a couple of hours, mashing or sieving or grinding endlessly. (in anycase, the newer generation of Indians really prefer the indian quick fix meals not rigorous ones. It is relatively easy (depending on how much cooking you do !) and could take a good 45 minutes or alittle longer at the most. Ok so this tutorial is having too many stories in them, ‘Must’ stick to the cooking ONLY !! So we have around 750 gms chicken breast. Two large onions, sliced. 5 Tbsp ( dont fret here ) of canola oil (or which ever medium you prefer to cook, eg: ghee, butter, regular oil). In a large pan, warm some oil, and when heated up, we add some of ’em onions and fry them on medium to high burner till they turn slight golden brown. Then we add, 1 Tbsp of garlic and 1 tbsp of ginger paste. Mix them together and fry well. At this stage, keep stirring on medium flame for a minute or so, then add the chicken pieces (which has been diced to 1 1/2 inches pieces) on high flame. Keep stirring them gently. From here on, the pictures will speak for you. When the chicken turn slightly brown in color, add, 3 sliced green chillies. In a seperate bowl. Add and mix the following dry ingredients. 1/2 kg of fresh yoghurt + 1 1/2 tsp of coriander + 1 tsp of redchilli + 3/4 tsp of turmeric. 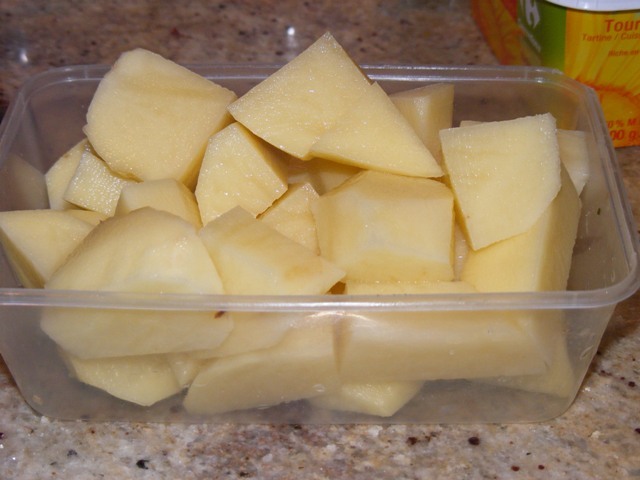 Meanwhile, we chop 2 large potatoes in 1 inch cubes. Add these to the chicken mixture. 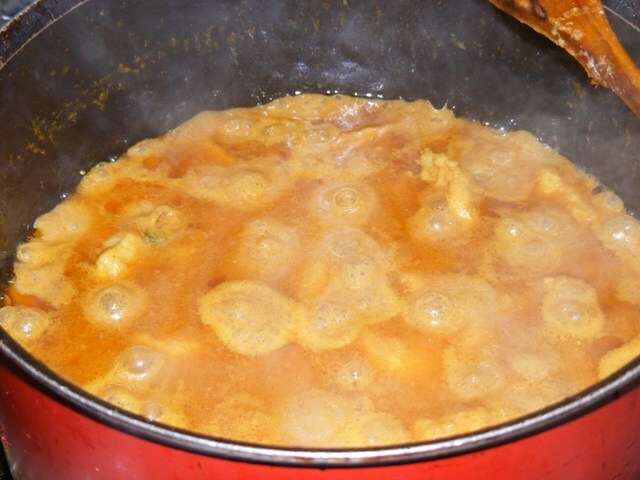 Now add 1 – 1/2 glass of water to the mixture and leave it to simmer after it comes to one boil, with the lid on. The chicken and potatoes will turn tender and eventually the oil will seperate on the top. It may take a good 25 minutes of simmering or less. 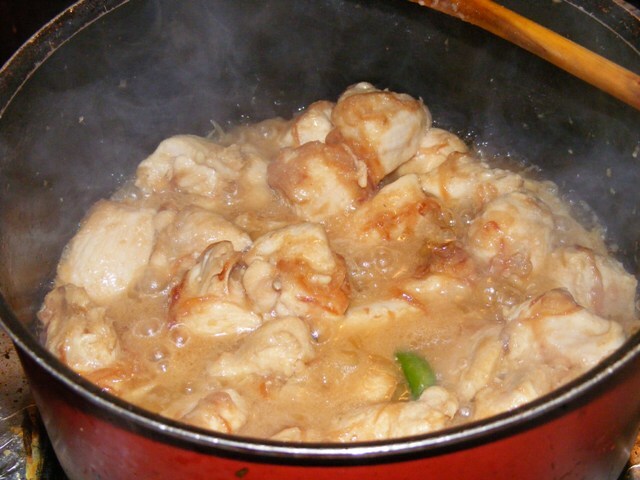 and it would look like this : I generally add the salt at this stage. I leave the estimate of salt to you since some people add more and some less. 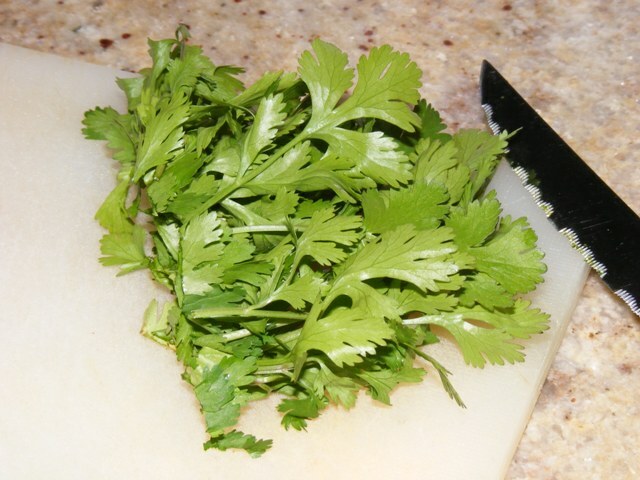 Coriander Leaves are generally used in almost all indian dishes as a garnish. wondering whats coriander leaves ?? They add an aroma, taste good and ofcourse the look of fresh green leaves on any brown dish is a quick color idea for any card maker !! Voila !! And here’s my ‘chicken ala Naush’ served on a platter or plate !